Social responsibility is certainly one of our time’s buzz words. Not only in the private sector, today even enterprises and enterprises in particular are required to get involved and assume their role in society. It goes without saying that this, unfortunately, does not always happen out of pure altruism: Just as a bad image can negatively affect turnovers, an image as “do-gooders” augments sales potential. In the end, however, it all boils down to one thing: That those in need receive the urgently needed help. But Corporate Social Responsibility – the acronym is CSR – should never be merely a means to an end. At Munich Business School (MBS), we are convinced that social responsibility should be an integral part of all entrepreneurial activity. As university teachers, we have therefore made it our goal to train entrepreneurs with a functioning sense of responsibility: Young people who, in their studies, have not only learned to master the theoretical knowledge and technical skills of entrepreneurship, but are, in addition, aware of their social responsibility – and will integrate this awareness into their professional lives. To achieve this goal, we have firmly anchored social responsibility in our curricula. For example, in the form of the Social Projects that in the second and third semesters are mandatory for the students of our Bachelor program. In addition, we organize events such as the Social Business Day where our students have the opportunity to discuss CSR-related subjects with experts from various scientific disciplines. 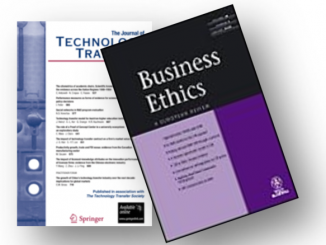 Further, special courses, for example on “Business Ethics”, form an integral part of the studies. According to our observation, our students take a keen interest for the issues of social responsibility. In the Social Projects, they have already organized and implemented a number of great projects. A non-profit student initiative was even established a few years ago: MBS Helps e.V. is the framework for the social commitment of MBS students in which impressive projects have already been implemented. As a private enterprise and university, it is, of course, our objective as well to meet our social responsibility. We do this, for example, by our dedicated work as a member of the university network “Bildung durch Verantwortung e.V.” (Education through Responsibility) which is committed to integrating teaching with social commitment. And of course, social responsibility plays a primordial role in the mission statement of MBS. Last Tuesday, approximately 20 MBS employees, among them the university management, several lecturers and administrative employees, demonstrated that this is not just an empty phrase. Upon the initiative of our colleague Prof. Dr. Patricia Kraft, who had organized the activity, we set out for Munich’s Bayernkaserne. The former barracks of the German military today serves as a reception center for asylum seekers and is an (overcrowded) transition place for approximately 2,000 refugees these days. It is also the place where the donations are sorted and distributed to the newly arriving refugees, many of them owning just what they are wearing on their backs. 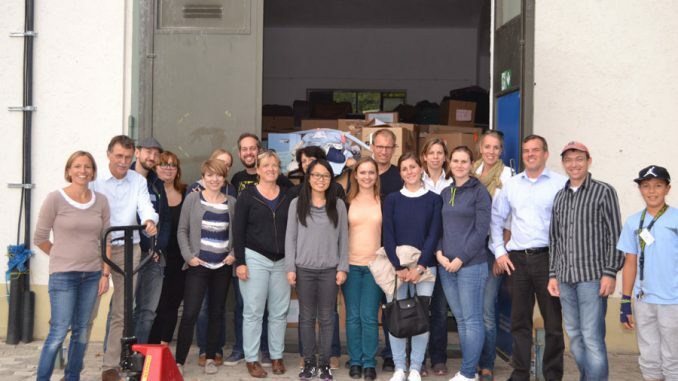 Due to the generosity of the people of Munich, the warehouses are presently well-filled: with clothes, toys, hygiene articles and much more. But there is a lack of volunteers who sift through the stocks and sort and prepare things for handover to the refugees. Just the right job for the MBS volunteers! Baby clothing really is cute but extremely difficult to sort. Should it be sorted according to sizes? To the length of sleeves? To its function (playground or bedroom)? And where in all the world should the fairy toy set with wings and the fairy dress go? One thing is for sure: From now on, we will recognize size 68 clothing from 30 yards away. And maybe next time we should take young children along: They are excellent sorters. Professors are thinking way too much for this kind of work. 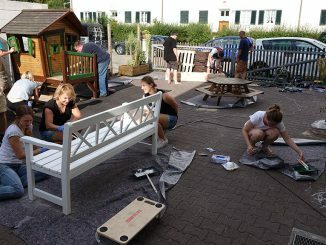 At the end of the day, we left the Bayernkaserne with the fulfilling feeling of having done something good for people who desperately need help. And we have become even more aware that social commitment is not a one-way street: It is not only the refugees, not only the needy who benefit from the volunteers’ commitment. For the latter ones, such activities are a rich source of knowledge and experience; and a great opportunity to making a contribution and to shaping a world that benefits all of us. The aid organization diakonia is urgently looking for volunteers to help sort and distribute clothing donations. 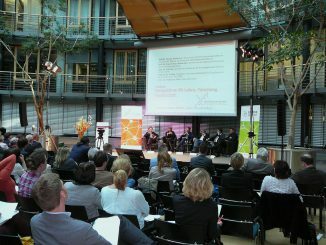 For further information and to register online, please visit: http://diakonia-fluechtlinge.de/zeit-spenden/bayernkaserne. Gabriella Maráz is Professor for Intercultural Management and Research Methodology and focuses on information and communication psychology and work techniques.